The Pie Hole: (Thai)ed Together. | | Quiet Lunch. The Pie Hole: (Thai)ed Together. Usually we feature recipes that we have yet to try and we let you, the reader, journey through the process with us. But today is a different story. Today we have a recipe that we actually had the pleasure of trying — we even have pictures! Thanks to We Are Never Full, we’re on a Thai kick this week. Make your pickled carrots by first gently heating the vinegar, water and sugar until sugar has completely dissolved into the water/vinegar mixture. In a bowl or mason jar, add shredded carrots and top with water/sugar/vinegar mixture. Toss or shake and set aside. 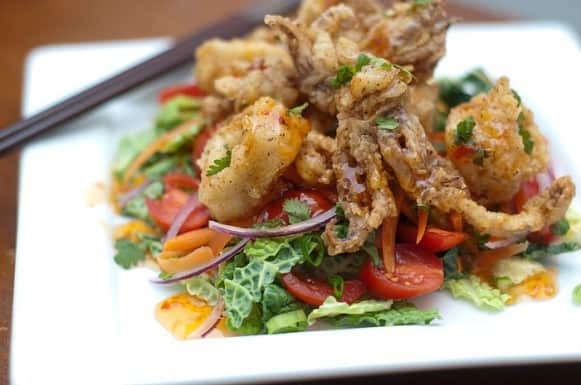 Slice calamari bodies into 1 inch rings. Dry these and the tentacles with a towel. Toss the calamari in the seasoned flour mixture. Shake excess flour off the calamari and fry in the oil until brown (about 1 minute). Remove with slotted spoon or spider and allow to drain on some paper towels. 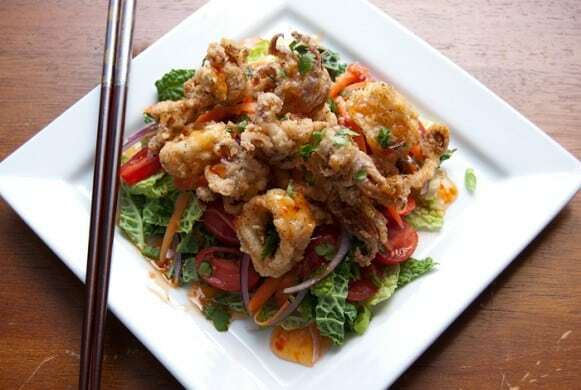 Cabbage on the bottom tossed with a bit of lime juice and olive oil to moisten a bit (optional), then topped with tomatoes, onions, pickled carrots, scallions, cilantro and crunchy calamari. Drizzle with the thai chili “sauce” and serve with some lime wedges. Enjoy!